The Times Cheltenham Literature Festival - what Difference Does it Make? The Times Cheltenham Literature Festival runs from 10th - 19th October this year, and one local book owner is very much a part of it. 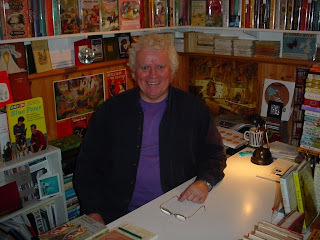 Peter Lyons, set up his bookshop opposite the Town Hall in Cheltenham, England, in 2000, after retiring from his lecturer position at Cheltenham Art School, now Gloucestershire University. 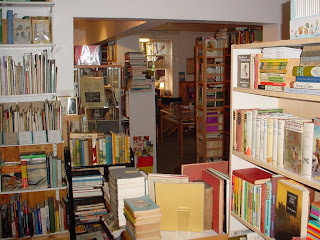 Peter Lyons Books is halfway between an antiquarian and second-hand bookshop, with a smattering of new books. He has a large range of fiction and non-fiction, with a growing collection in art and poetry, his personal favourites, but he specialises in children’s books. His stock includes first editions, signed and rare books. Put simply, all manner of collectables. Dealers are welcomed to use the shop as a bit of a base, sometimes even taking Peter’s own books for signing, while he mans his shop. And whilst much business goes through his till, he says that many books never even touch the shelves, a significant part of business going on behind the scenes. Catering for a niche market underpins Peter Lyons’s business in today’s challenging market. “There’s still a lot of money out there”, he commented. “The market on the whole is OK. We’re not suffering as much a high street retailer. Sometimes I might be quiet and sell only two books in a day, but they can make up for not selling twenty ordinary books.” A recent customer made an investment as a Christening gift for a baby boy, a first edition copy of ‘Just William’. The literary aspect of the Festival appeals more to the passionate book expert like Peter Lyons, currently growing his specialist poetry section with first editions of works by Ted Hughes, Seamus Heany and Silvia Plath. But even Mr. Lyons will agree that the celebrity factor attracts people, and people are good for business for both the Festival and businesses like his own. He’s not hesitant to admit, he enjoys seeing some of the stars as much as anyone else. “I’m quite looking forward to seeing Dawn French. I hope she’ll come in, probably not dressed as the Vicar of Dibley, but it would be fun.” Dawn French is promoting her book, ‘Dear Fatty’ which was released on October 2nd. “I’m really looking forward to a successful two weeks. I hope,” he added. “All my life I was interested in books and was a big collector. My friends said it wouldn’t work because I’d never want to let one go. But in my first week I sold so many, that I really got the bug of selling, I loved it.” His enthusiasm and passion for his job is clear. Peter Lyons’ love and respect for his stock takes on an almost living quality. “I sometimes make a sale and quietly think, I hope that’s going to a good home. Or if I’ve talked to the customer a little, I’ll be pleased to pass it on to someone who appreciates it. I suppose I should have set up a pet shop”, he jokes. Good for book lovers that he didn’t. The Cheltenham Festival is Britain’s oldest literary festival, founded in 1949 by amongst others, John Moore and Alan Hancocks, a local Tewksbury author, who was well connected in the literary world. Your writing, along with the photo, conveys a wonderful sense of passion that Peter Lyons seems to have for books and his business.